Speculators Leaving the Oil Market: A Bullish Case for Oil? This chart is bullish for oil. 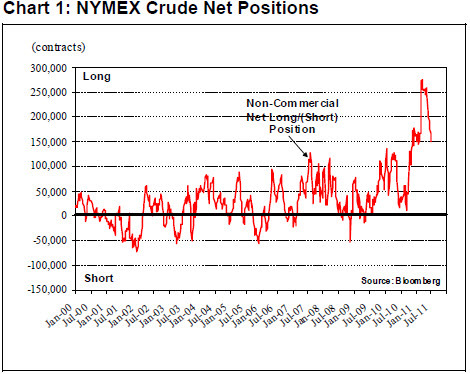 It shows the number of non-commercial net long crude oil positions in the NYMEX (New York Mercantile Exchange) is moving down – these are the people we all call “The Speculators”. Getting these (politically unpopular) people out of the oil market is what I think one of the primary goals of the IEA was, when they announced a globally co-ordinated release of 60 million barrels into the market in late June. This shows the speculators leaving the market – but the oil price is not declining. This shows real demand is taking the place of speculators. Now of course it could be argued that without the IEA intervention, world oil prices could be $10/barrel higher right now. With expected demand rising up 4 million barrels a day more through the fall (this seasonal increase happens every year; it’s not a guess) it shows oil investors are going to have to see a dramatic decline in the world’s economy to keep oil lower.